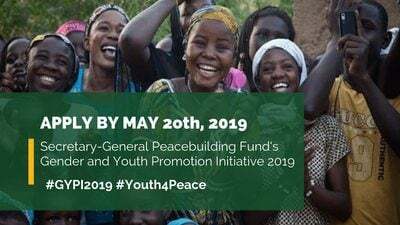 The United Nations Secretary-General’s Peacebuilding Fund’s (PBF) Gender and Youth Promotion Initiative #GYPI is an expression of the Fund’s commitment to inclusive peacebuilding. It supports the empowerment of women and the advancement of gender equality and recognizes the role of young people as central to the relevance and effectiveness of PBF’s overall peacebuilding portfolio. Through the initiative the PBF seeks to increase its impact and advance the implementation of the Secretary General’s Seven-Point Action Plan on Gender-Responsive Peacebuilding, Security Council resolution 1325 (2000) and others on Women, Peace and Security, and Security Council resolution 2250 (2015) on Youth, Peace and Security. This year’s call for the GYPI solicits proposals from both civil society organizations (CSOs) and UN Agencies, Funds and Programms (UN AFPs).